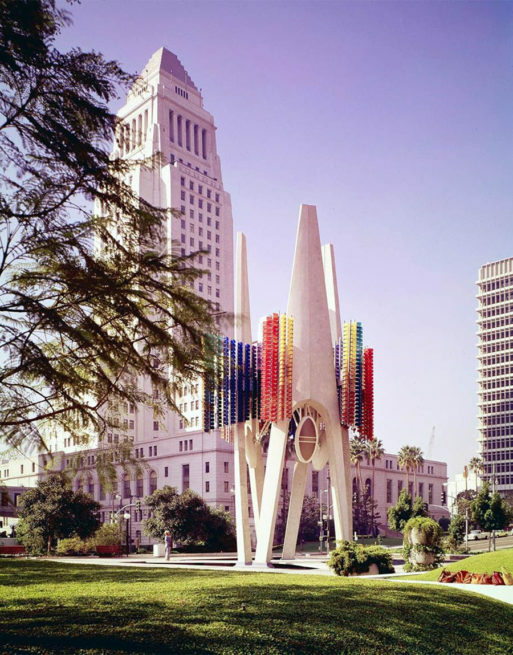 The Triforium, a six story-tall, sixty-ton sculpture in the heart of downtown Los Angeles, is coming back to life. Designed by artist Joseph Young in 1974 to be a monumental musical instrument, synchronizing sound and light into a new “polyphonoptic” art form, with 1,494 colored glass cubes, a visionary computer system, and a custom glass bell carillon, it was unlike anything else in the world—and far ahead of its time. Starting October 19th, a series of public events called Triforium Fridays will bring this long-maligned “polyphonoptic” public artwork back to life with performances by Reggie Watts, Julianna Barwick, Thao (of the Get Down Stay Down), Jherek Bischoff, the LA Opera, Carolyn Pennypacker Riggs, TAKIOPROJECT, Molly Lewis, and a puppet show from the Bob Baker Marionettes. This diverse collection of artists will “plug in” live to the Triforium, activating the sculpture’s polyphonoptic responses in real-time, thanks to an LED activation running the Triforium’s original program software, recreated from Joseph Young’s notes. It will be a multicolor arena in the heart of civic center. Each evening will open with a short program of polyphonoptic compositions called Bright New Works created exclusively for the Triforium, and co-curated by dublab. Contributing artists include $3.33, Ben Browning of Cut Copy, Daedalus, George Jensen, Scott Gilmore, John Tejada, Secret Circuit, Mary Lattimore, Bobby Birdman, and Ben Babbitt. In the sprit of Joseph Young’s interdisciplinary vision, each event will also feature original scent activations by The Institute for Art and Olfaction. DJ sets by dublab, YACHT, and Restless Nites will round out the program. The series, curated by Claire L. Evans and Jona Bechtolt of YACHT and the Los Angeles app 5 Every Day, will be hosted by Tom Carroll of Tom Explores Los Angeles, and is made possible with the assistance and support of LA City Councilmember Jose Huizar, NOW Art LA, LA2050, and the National Trust for Historic Preservation.